(July 9, 2013, Toronto, ON - FOR IMMEDIATE RELEASE) Learn more about the tree canopy along Highland Creek at the Morningside Park Tree Tour. Morningside Park encompasses two Environmentally Significant Areas (ESAs) and an Area of Natural and Scientific Interest (ANSI) where visitors can see sugar maple, American beech, white ash, and red oak trees, as well as the variety of wildlife supported by this extensive green space. WHEN: Wednesday, July 17, 2013 6:30 p.m. – 8:00 p.m. 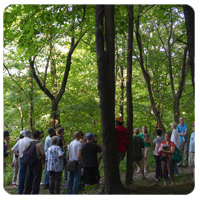 The walk will take participants through the forested ravine and discuss the important role of our urban tree canopy. As we explore this quiet valley and its interesting waterway, tour leaders will also talk about the history of the valley and current projects underway to help the health of the ravine system and our local environment. Participants will learn about the threat of the Emerald Ash Borer on our urban forest and receive information on free and subsidized planting programs to help residents take action at home. The walk is co-hosted by LEAF (Local Enhancement & Appreciation of Forests) and TRCA, in partnership with the Highland Creek Green Team. Funding support is provided by TD Friends of the Environment Foundation and Ontario Power Generation.